Mrs. Wakeman was born on August 11, 1922. She died on October 5, 2018. Carole Gaye Gourdin Wakeman quietly passed away October 5, 2018, at the age of 96. She was in preceded in death by her husband Robert Downs Wakeman and son Wayne Gourdin Wakeman. Survivors include daughter April [Steve Mras], Brian [Michelle] and Greg [Carol], including 6 grandchildren and 5 great grandchildren. Of all her accomplishments she was most proud that her children and grandchildren had all graduated from college [except 2 who are expected to graduate in a.2020]. The importance of education was shown when she returned to school and received her B.A. from California State University Fullerton in 1986 at the age of 63. She endowed the Wakeman Seminar room for the WoMen's/Adult Reentry Center at Cal State Fullerton and multiple scholarships for those, like her, returning to school after many years. 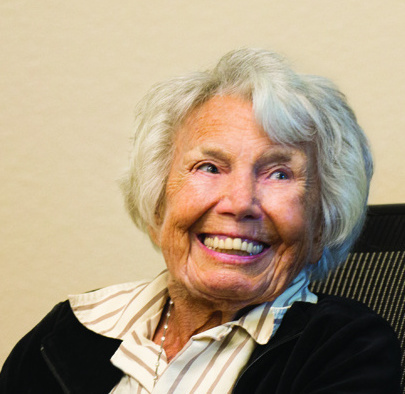 She is remembered by many as their Girl Scout Leader, Den Mother, active member of St. Paul's Lutheran Church, consistent Opera Class student, and docent at the CSUF Art Gallery. Graveside service will be held on Saturday, October 13th, 2018 at 2 PM at Loma Vista Memorial Park in Fullerton. Donations in lieu of flowers can be made to the CSUF Foundation for the WoMan's/Adult Reentry Center. April, l am so sorry for your loss. Words cannot express my heartfelt feelings. When Wayne and l were kids she was always so sweet, never a harsh word (even though we gave her plenty of reason to). l think the thing that sticks in my mind was, a day or so after Wayne's funeral, l was at the cemetery talking to him, making my Peace. When l looked up, Mrs Wakeman was holding the family back so l could have my time. l have never told anyone this, l was moved greatly.